Not everyone is born with the movie star smile. There are many reasons why our teeth can become crooked, too short, too long, rotated, or spaced too far apart. We can fix many of these issues with crowns, veneers, or restorations. Often we find that Dr. Weldon can correct these problems most effectively and efficiently with the help of Invisalign. Invisalign™ uses custom-made plastic aligners that are worn over your teeth. These aligner trays are composed of thin, smooth, comfortable, and nearly invisible plastic. The design methodically and gently shifts teeth into proper alignment which is based on the specified movements your dentist has determined will correct the teeth. Invisalign does not contain any metal brackets and utilizes no wires to tighten. 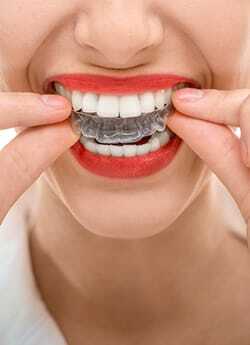 Each aligner is worn both day and night for two weeks. As your teeth change, you will change Invisalign™ aligners to comfortably fit as the process continues. With Invisalign you can eat whatever foods you like to enjoy and do not have to be concerned with food becoming stuck in braces. You simply remove the tray before eating. A second benefit to Invisalign’s removability is that it allows you to brush and floss the teeth as you are normally accustomed to. This is important because teeth covered in metal braces are more prone to decay and discoloration, much of which is undetectable until the braces come off. The sharp edges of traditional braces also can irritate the gums, tongue, and cheeks. Invisalign is smooth and avoids these problems. There are no painful adjustment appointments with the dentist. You simply move from one tray to another in the comfort of your home. Invisalign now offers a custom retainer system called Vivera. These clear retainers will ensure that the teeth stay in the desired position that you worked so hard to achieve. As with most dental treatments, the planning begins with a consultation between you and Dr. Weldon. It is important to remember that this is a collaborative effort. This ensures that the results attained are optimal for both function and esthetics. From there, a series of photos and impressions are taken. Dr. Weldon will then utilize Invisalign’s custom computer programs to determine the course of treatment. The retainers are ordered and you pick them up from the office. Although there are no regular wire tightening appointments, periodic follow-up appointments are necessary to ensure that the optimal results are being attained. If you have interest in Invisalign or any of our other cosmetic dentistry treatments, feel free to click here to contact us electronically at any time or call us at (352) 622-3236.